Criminal psychologist Kate Fuller (Olga Kurylenko) is assigned to a case where a woman is the prime suspect in the murder of her husband. With only the couple’s young daughter as a witness, Kate tries to get to the bottom of what happened and is startled when the woman claims a demonic figure was responsible. After getting the woman institutionalised and her daughter removed from her care, Kate starts to realise she’s made a huge mistake as evidence surfaces suggesting that the woman may have been telling the truth. First-time feature director Clive Tonge has chosen to explore the subject of sleep paralysis in Mara and it’s a topic that is sure to leave many horror fans slightly petrified. Having experience sleep paralysis myself, I found the film uncomfortable to watch at times but incredibly effective. Drawing plenty of inspiration from Japanese horror, particularly Ring and The Grudge, Mara is a psychological horror that plays on your worst fears. Tonge knows how to crank up the tension and the film will have you hiding behind your hands multiple times. Despite initially being dismissive of the idea that a demonic creature by the name of Mara could be responsible for the death of her case’s victim, Kate changes her mind when she begins to experience sleep paralysis of her own. Piecing together clues from the crimes scene, Kate unwillingly goes down a rabbit hole of paranoia and theories, bringing her own sanity into question at the same time. Is Mara a real thing or is she a hallucination of those with sleep paralysis? Tonge doesn’t keep you guessing too long, allowing the audience to see his hand fairly early on in the film. He also knows that less is most certainly more and he’s crafted a truly spine-tinging experience. I mentioned Ring and The Grudge earlier, and Mara definitely brings back the horrifying feeling I felt the first time I watched those two movies. There’s a fantastic use of sound effects to unnerve you and the visual effects are very effective too. There are multiple times when Kate, and other characters, are trapped in sleep paralysis only able to move their eyes as Mara appears before them. It’s pretty scary stuff! Mara does suffer from being a little over long. That’s likely a first director issue as there’s one too many similar scenes of Kate paralysed as Mara appears. About 15 minutes could have been trimmed from the film to make it a little leaner but it’s not a huge issue. It may have just reduced the repetitive feel that does start to wear off after several appearances from Mara. Olga Kurylenko makes for a strong lead. Having been a Bond girl in Quantum of Solace, it’s nice to see her doing something a little meatier. Her character is a little under-written but she makes the best of the material. She particularly shines in the scarier moments and she really commits to the material. Some of the best scenes are when Kate interacts with Dougie (Craig Conway), a former drug addict who is also a suspect in her murder case. The two actors bounce off one another and together they really notch up the intensity. 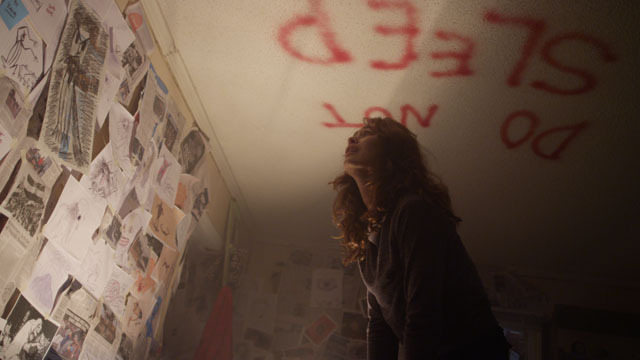 Mara is a surprisingly effective horror that is sure to terrify plenty of viewers. It may not have a wholly original premise but it uses its influences wisely. I’m not a person who is easily scared, if ever, and I found myself muttering under my breath and reaching to cover my eyes multiple times. Tonge understands that fear of the unknown is stronger than seeing the antagonist and he uses that to his advantage. If Mara doesn’t leave you a nervous wreck, you’ve obviously got nerves of steel.